Pictures by Chris Hauser. Thanks! 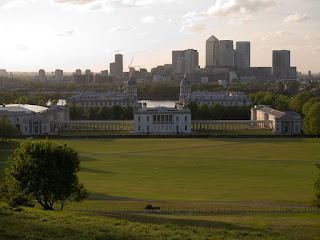 If you've seen enough of central London, one great place to go is Greenwich. 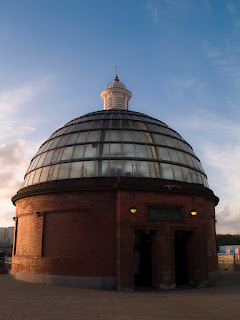 It has a very Victorian, small-town feeling, with an imposing old Naval College campus, historic pubs, the Maritime Museum, and the rolling hills of Greenwich Park, with the famous observatory on the hilltop. Getting to Greenwich takes a while, but it's simple enough: go there with the Docklands Light Railway (DLR), or one of the commuter trains, or -- even better -- take the Thames Clipper ferry from one of the landings in central London: it's the most unique way to see the waterfront. So we'll run towards the right along the footpath, with the river directly to our left, and the Royal Naval College on the right. The buildings are grand monuments to the British Empire, although they're not used by the Navy anymore. London is trying to put them to good use, with music and arts colleges occupying some of the buildings. At the far end (east) of the campus, you'll find one of the most historic of English pubs, the Trafalgar, where all the Navy heroes once drank their rum. Make sure to return sometime with appropriate clothes to have a pint and to soak in the riverfront atmosphere. From the Trafalgar, turn right to head up Park Row, with the college on your right. After crossing Romney Road, you will have the National Maritime Museum on your right. You can gaze at the few maritime artifacts in the yard if you want. 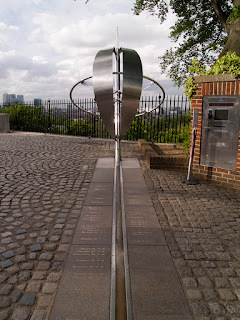 Otherwise, continue through the park gate, going straight uphill towards the Royal Observatory. The 0 Meridian is drawn on the ground there, and it even divides the building and a doorway down the middle. In the old days, ships waited in the river to watch for the red ball to be dropped down the pole so they could set their chronometers to exactly 12 o'clock. Your digital watch probably doesn't need the extra help. Now you can loop clockwise through the park, first heading to the left (east) along the hilltop among the amazing old chestnut trees. In the back-left (southeast) corner of the park is a nice fenced-off gardens to run through, called the "Wilderness", with some impressive cedar trees. Loop around the back (south end), running westwards. Then follow the edge of the park along the west side (turn right to head north). Before the path starts going downhill, you'll come to a small exit between some interesting old houses. As nice as the park is, here is a chance to see more of this nice Victorian town. Go out through the park gate to the street, Croons Hill, turn right and run downhill for a few blocks till you get to King George Street. Turn left here to run through the old Victorian row houses once used by Navy officers and cadets. Turn right on Luton Place and then, turning right again at the Prince Albert pub, you just need to follow Royal Hill down to where it ends at High Road. Now turn right to head back the last 250 meters to the starting point, passing the old Greenwich Market on the right side, just after the church.